Up until 1993 there were only two types of Mennonites living in Nuevo Ideal Durango Mexico: Old Colony Mennonites and Evangelical Mennonite Mission Conference. There are Old Colony churches in most of the Colonies accept the one I grew up in, since it is too small and far from the rest. Up until the mid-90s, we had to ride a horse and buggy for a good 30 minutes or so to get to the nearest church. After that, we started driving cars and using hydro. There is still no church in my home Colony. 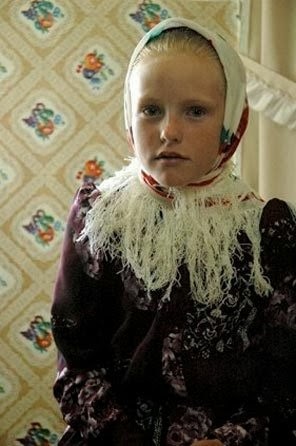 Old Colony women always wear black kerchiefs as a head covering after marriage. All females wear a black one to church whether married or not. On any other occasion, girls wear a white one, usually just to keep warm; we didn't have to wear it all the time. Women always wear self-made knee length colourful, floral dresses with pleats in the skirt. We have our own schools and only learn basic math and lessons from the Bible, which is written in High German. One teacher per school, and girls sit on the right side of the school and go until the age of 11-12 and boys sit on the left side and go until they are 12-13 years old. 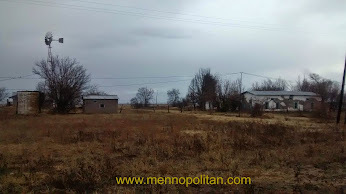 These Mennonites only had one church for all living in the Nuevo Ideal area, and all the members had to drive to this one church. They have built a few more new churches since then. They speak Low German as well and have always used hydro and driven cars. They don’t wear head coverings and wear modern clothing that can be bought in stores. They also have their own school but use a modern curriculum, they have a teacher for each grade and learn English and Spanish and go until the graduate each grade.